These groups and associations oversee the production and distribution of optical media worldwide. Below you’ll find important groups and associations with valuable disc and optical media resources. Blu-ray Disc Association – Your one stop source for Blu-ray knowledge. Get the latest movie releases, news, product upgrades, and tech support. Content Delivery and Storage Association (CDSA) – A worldwide forum with a long-standing tradition of protecting content. Aims for responsible delivery and storage of software, entertainment, and other information. 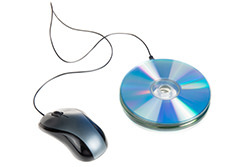 DVD Forum – Run by techies in the thick of the industry. This insightful forum shares ideas and information about the formats of DVDs and the latest innovations. Also has an easy to follow FAQ section. DVD Plus RW – Need to know anything and everything about DVD formats? Browse up to date FAQs, product overviews, firmware and upgrades plus format comparisons. International Disc Duplicating Association (IDDA) – An independent association that tries to maintain an honest forum about the recordable CD/DVD industry. Includes helpful glossary, disc tests, and special membership offers. Media Tech – A group of worldwide manufacturers sharing the latest news on optical and removable storage technology. National Association of Broadcasters (NAB) – The machine behind radio and television as we know it. The top trade association fostering content and technology advances in broadcasting.